Turbochargers like superchargers have been used in many applications (Automotive cars, aircraft, trains, ships and much more). They were invented by the Swiss engineer Alfred Buchi, who made a patent for the internal combustion turbocharger in 1905. In 1962/63 Chevrolet (General Motors) were the first to use them in passenger cars, although we believe they were used in racing as far back as 1952. Of course lets not forget the dominance of the Audi Quattro in the rallying world in the early 80’s. The early 80’s saw a number of turbocharged cars being manufactured, but in this early stage of mass development, some cars were quite exciting to drive. Like superchargers, turbos compress the air flowing into an engine, therefore an increase in oxygen and fuel means more power. Unlike superchargers, turbochargers use the exhaust gases from the engine to spin a turbine (Turbo), which then spins an air pump (compressor). The turbine can spin as high as 150,000 rpm’s. Turbos are bolted to the exhaust manifold, where they use the exiting exhaust gases to spin the blades in the turbine. The turbine is connected to the compressor by a shaft. The compressor then pumps the air into the cylinders. Most turbochargers use a fluid bearing. This type of bearing supports the shaft on a thin layer of oil that is constantly pumped around the shaft. This helps cool the shaft and some of the other turbocharger parts, and it allows the shaft to spin without much friction. Modern designs have ironed out many of the problems inherent in turbocharging and much of the reliability issues no longer exist. Like any forced induction, a modern fuel injected car will benefit from having the cars computer remapped (see engine management), as it is very likely that the amount of air will be outside its program range causing poor running or worse. Most modern engines can generally cope with a mild installation, but just be aware. Also consider the strength of your engine as the extra pressure and temperatures place more stress on your engine, however some modern engines can cope with mild boosted installations. We would recommend getting a professional installation, as there’s a lot of additional work involved in installing a turbo to your car. Compressed air is hot, adding a good intercooler can help to reduce the temperature of the air, making the air more dense for a better combustion. It is important to point out that if the compressed air is too hot, or if there’s too much boost, a poor mixture, low octane fuel used, or too much ignition advance, this is likely to cause detonation (knocking/pinking). Detonation is where a second explosion of the fuel/air mixture occurs, causing a shockwave effect in the cylinder, this can basically destroy the engine. But most installers will obviously be aware of this and there are many ways to combat this effect. Beware of compressor surge. This is where the airflow moves backwards in the compressor, which can cause damage to both the engine and turbo. BOV’s (blow off valves) are designed to counteract this. There are lots of turbocharged cars available straight from the manufacturers, here is a list of just a few. Turbos are known to suffer from lag, (turbo lag) due to the time it takes the turbine to spin up on acceleration. One answer is to reduce the weight of the spinning components. Smaller turbos therefore suffer less lag than larger turbos, however larger turbos will produce more boost at higher engine speeds. Although there has been a lot of development to minimise this and many modern cars have pretty much unnoticeable turbo lag. The use of two turbos (Twin Turbo), has been used by many performance cars to combat turbo lag. 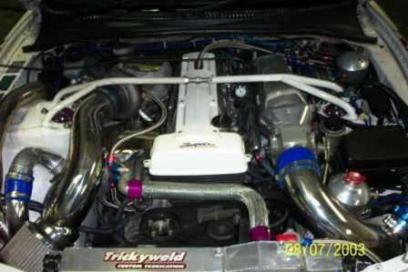 Using a small turbo for quicker boost and a larger turbo for more high speed boost. Wastegates allow the use of a smaller turbo to help reduce any lag while preventing it from spinning too quickly at high engine speeds. It allows the exhaust gases to bypass the turbine blades when the pressure gets too high, allowing the blades to slow down. Many turbos have an integral wastegate. Most diesel engines do not have a wastegate because the amount of exhaust energy is controlled directly by the amount of fuel injected into the engine and slight variations in boost pressure do not make a difference for the engines. Specially made ball bearings are sometimes used. They allow the turbine shaft to spin with less friction than the fluid bearings. They also allow a slightly smaller, lighter shaft to be used. 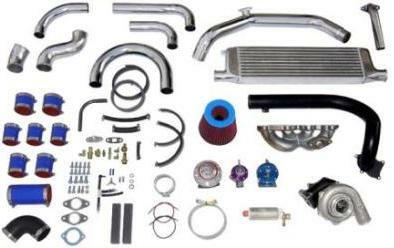 This helps the turbocharger accelerate more quickly, further reducing turbo lag. Adding an intercooler is a good idea. An intercooler resembles a radiator and cools the hot air that passes through it with cooler air outside created by the engines cooling fan. This cooling of the air makes the air more dense and therefore contains more air molecules, hence creating more power (more oxygen, more fuel = more power). Boost is the increase in pressure in the intake manifold and is normally measured in PSI (pounds per square inch). It is important to keep within the engines and all other components limitations. The fuel rating used as well as efficient charge cooling will have an effect on the amount of boost that can be produced. A boost controller can be used to trick your boost pressure actuator into thinking it is running less boost, therefore opening the wastegate later. It does this by limiting the amount of pressure getting to the wastegate actuator, hence higher boost. There are also boost controllers that can be controlled through your engine management system. The familiar noise, of air being released at pressure as you let off from the accelerator pedal. These valves allow the pressurized air to be released from the intake as the turbo continues to turn when you let off the throttle. If this didn’t happen, damage could occur to the turbo and other components from the excess pressure. 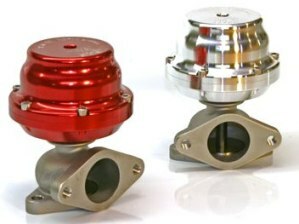 However there is a difference between a blow off valve (dump valve) and a bypass/diverter valve. Essentially the Blow off valve, dumps the air out directly into the atmosphere and does not allow for the fact that the mass air flow sensor will still be expecting the released air to go into the engine. This causes popping and burning of unburned fuel, as the engine runs lean, due to the car computer adding too much fuel, this can eventually cause damage to your engine. 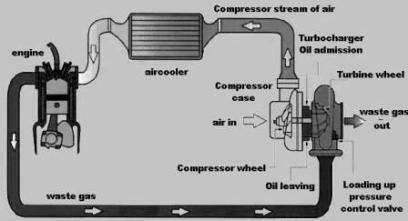 Bypass/diverter valves however redirect the air back to the compressor and so the quantity of air is the same. There is no advantage to using a blow off valve over a bypass/diverter valve (actually the opposite) and all that extra noise is just for show. This device allows an engine to cool down by letting the engine idle for a set time when you stop, even with the keys out of the ignition. The oil will continue to flow and therefore cool the turbo down. It is important to allow the turbo time to cool, as the oil that lubricates the turbo can heat up and start to solidify, causing ‘coking’, which will damage the turbo. It’s best to stay off boost for the last few miles before your journey ends. Coking isn’t such a problem with diesel engines, as diesel engines have lower exhaust temperatures and run at lower engine speeds. 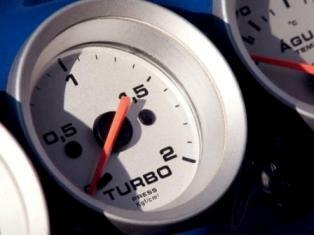 If you’re tuning your turbo settings for optimal or beyond performance, then you may want to install a turbo boost gauge to keep an eye on your boost pressure. It is recommended that you carry out frequent oil changes and use synthetic oil as turbochargers can be damaged by dirty or ineffective oil. 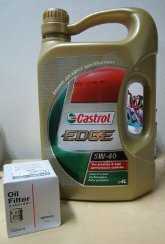 Synthetic oil has better flow characteristics than conventional oil from the start and does not break down as quickly. It is recommended that you use higher octane fuel to avoid the dreaded knocking effect. Super unleaded is usually 97 RON and around 5p per litre more than norman unleaded which is around 95 RON. There are other steps that can be carried out to improve the efficiency of your turbo, such as clipping, E-boosting, water spraying, water injection etc. These and more will be covered at a later date.